It is the third year of success for ISL. Matthias Schmutzer joins Juliette Leader and Ann Cloos as an International Biology Olympiad competitor. He was successful in the highly competitive first and second rounds coming in 3rd overall out of around 280 competitors. 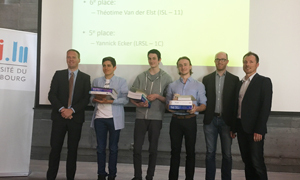 Another great "well done" to Théo Van der Elst a grade 11 student who came in 6th overall.